IF the Middle East Respiratory Syndrome (Mers) spreads further in ASEAN, airline, hotel, and mass public transport stocks would be among the hardest hit, said Nomura in a report on Monday. In Singapore, these would include tourism-related stocks such as Singapore Airlines, Tiger Airways, Mandarin Oriental International, Hotel Properties, and Hotel Grand Central. And with individuals reluctant to be in crowded places, Nomura added that other stocks that could have the most impact are those in retail trade and restaurants, hospitals, and public entertainment. It named Genting Singapore, Raffles Medical Group, SMRT Corp, SBS Transit, and Metro Holdings as Singapore-listed groups likely to be affected. "Still, we would expect the impact to be temporary as, based on information so far, we expect the spread of Mers to be brought under control fairly rapidly," said Nomura analyst Mixo Das. Mr Das stressed that historically, the impact of disease outbreaks on stocks tends to run ahead of actual economic costs or impact on human life. As long as the outbreak is contained quickly and limited in scope, Mr Das said, Mers is likely to have only a temporary and one-off effect, thus presenting a buying opportunity. "This is because the impact from such outbreaks are usually limited to the demand side (without disrupting the supply side through an impairment of infrastructure or labour supply), and thus the recovery is quick. Also, given the one-off nature of such an event, the impact on stocks is likely to be more modest and short-lived than that on corporate earnings. Earnings expectations are also slower to react," said Mr Das. 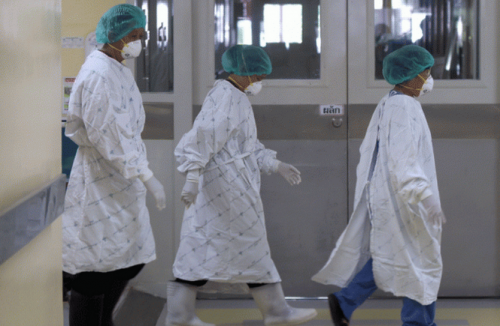 While comparisons to Severe Acute Respiratory Syndrome (Sars) are inevitable, both Nomura and DBS believe that Mers is likely to have a milder impact than Sars. The disease has killed about 450 people in nearly three years since it was first identified in Saudi Arabia, compared to 774 killed in eight months during the Sars crisis. In terms of fatality rate, however, Mers is ahead at about 37 per cent - much higher than the 10 per cent for Sars. Statistics aside, analysts also believe that Singapore is now better prepared for an outbreak. Said DBS analysts Paul Yong and Mervin Song: "Even if Mers does show up in Singapore, a Sars-like scenario in which the consumer and land transport companies and even the whole economy was hit is very unlikely, given that the authorities are well prepared to deal with it, given the lessons learnt previously." As for Sars' impact on financial markets and travel in 2003, DBS said that the Straits Times Index (STI) fell by about 3 per cent from end-February to April 25, before climbing 9 per cent until May 26; at the height of Sars-related travel restrictions in May 2003, Asian air passenger traffic fell as much as 51 per cent from a year earlier. Even so, the DBS analysts see healthcare and telco stocks as "safe havens". "Drawing from 2003, stocks that performed well include healthcare and healthcare related stocks, while telco stocks proved to be resilient. Notably, the badly affected stocks in travel and hospitality and consumer did rebound post-Sars once the situation was under control," said Mr Yong and Mr Song.